Are you ready to suit up as Rey? Now we're talking! Pretty much everybody is all about Rey, this hero of the new installment of the Star Wars franchise. There's plenty to like as she's a cool character to root for. But, if you're thinking about goin' on out and trying to save the day as Rey, well, there are a few things you're going to have to attend to first. You're going to have to get all your gear right! Start out with a Rey costume, naturally. And we've got plenty of those to choose from! But to take your cosplay to the next level, you're going to need all the accessories. Of course, Rey wouldn't be caught on Jakku without her quarterstaff. It's a mightily handy accessory! And when you need to outfit yourself with authentic Star Wars gear, look no further than Anovos Productions. They've created this authentic Rey Quarterstaff Prop, and it's ready to help you get into the Star Wars action! This Star Wars The Force Awakens Rey Quarterstaff Prop is an authentic movie replica prop. It was meticulously created using 3D scans, measurements, and reference taken from the original screen-used production assets. It measures 6 feet long and is constructed with flexible polyurethane with a fiberglass rod. Attention to detail is a must for serious fans, and Anovos does not disappoint. The finish has a handcrafted desert weathered appearance, fabric handle wrappings, and an adjustable strap with metal snap latches. You could use it as a costume accessory, or a display piece, with quick disassembly features it's ready for easy transportation and storage. Star Wars fans are in a class all to themselves, and most assuredly appreciate authentic Star Wars gear. This quarterstaff is officially licensed by Disney and Lucasfilm, and since it was designed based off of the original movie prop, we know that the powers-that-be gave Anovos their blessing to make this signature accessory. 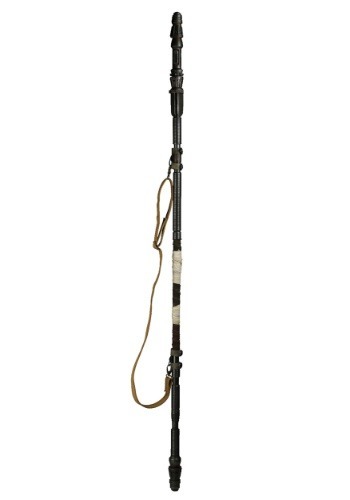 And this movie replica quarterstaff to your collection, and you'll have a cool piece of Star Wars history!